Week 3 baking theme was white chocolate. While brainstorming what I was going to make I kept thinking about one of my favorite cookies, white chocolate macadamia nut, but that seemed so obvious. Plus I already have that recipe posted. So after some more brainstorming I decided I would make puppy chow using white chocolate chips instead of regular semi-sweet chocolate chips. In my excitement of knowing I was going to fulfill the week 3 challenge I totally forgot about the whole “baking” thing. There’s no baking involved with puppy chow. Duh! I didn’t figure this out until after the puppy chow was made. Well I’m not going to waste this recipe. The white puppy chow made a perfect backdrop for some of the red, white, and pink Valentine’s Day M&M’s, so I *had* to add some to the mix 🙂 Whip up a quick batch for the love of your life! In a microwave safe bowl put white chocolate chips and peanut butter together. Microwave on high for 1 minute. Stir to combine. If mixture isn't creamy microwave in 30 second intervals until everything is smooth. Measure the 9 cups of cereal in a large mixing bowl. Pour the white chocolate and peanut butter mixture over the cereal. Carefully stir to coat all the cereal evenly. In a large ziplock bag pour in the cereal mixture. Dump in the 3 cups of powdered sugar. Zip the bag closed and give it a shake to coat all the cereal with the powdered sugar. Pour into a large serving bowl and gently stir in the M&M's. Puppy Chow is a huge hit in this household. 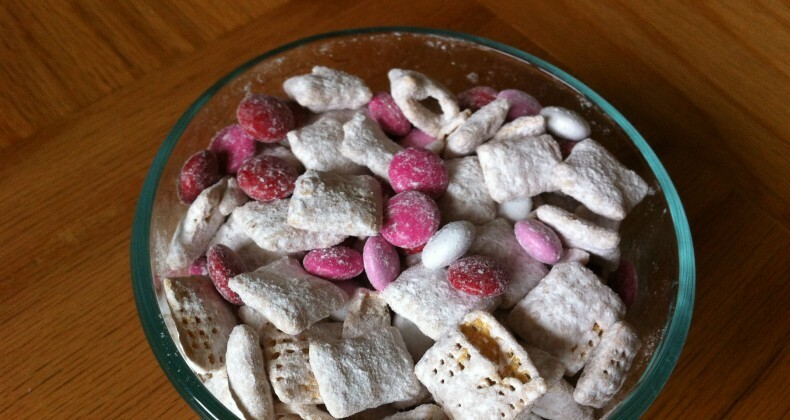 A few of my kids request puppy chow for birthday gift…their very own bucket all to themselves! And if that doesn’t work(it never does) they request it for their birthday dessert! A bunch of doggy food fanatics around here!